This is another case of hallux valgus with a symptomatic accessory navicular bone which was recently treated. The xrays show the improvement in the positioning of the big toe in relation to the second toe with less crowding in the webspace. Note that rotation of the big toe has also been corrected. The intra operative photo shows the X-plate(TM) . This is the first of its kind in Malaysia which provides advanced forms of fixation for this type of surgical correction for hallux valgus. Hi Dr. Khairul, I am the wife of your recent patient, Mawi, and we think you did a good job on the operation. We just went to clean his dressing this morning with Dr. Kamal and everything looks like in a good shape, and we are going to take out the stitches next week. Is there any dos and don't while he is recovering? what about the things that he can or cannot do after the recovering process of 6 weeks? Will be good to know. Btw, is it ok if I pinch these pictures to put on my blog?? What is the k-wire for?Just to share about mini invasive surgery.May be u can try that.I see here in Bordeaux, they have good result with mini invasive surgery of hallux valgus. thanks for the operation, xplate hallux valgus. so far dah bukak jahit, ada satu tempat tak berapa attached lagi. The feeling now, cam ada pulling sensation kat ibu jari and small sticth area near the thumb..
Yg merisaukan saya sampai dub dab dub dab, ialah macamana proses nak cabut wire tu..ada bius ker, or cabut terus cam Rambo?...MAwi.. I am glad the surgery went well. I hope by now you should be on your feet and getting back to normal activities. Yes you can take the pictures from the blog. KLFAC is also on facebook. Do become a fan! 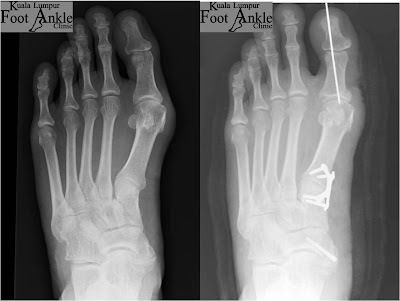 I have seen the minimally invasive work for Hallux valgus correction and yes it does work! I find that the pathology in our region is very different than that of our western counterparts. There has been a massive trend to perform scarf osteotomies, chevrons etc but unfortunately, I have had a large number of patients consulting me for recurrences. Thanks for your comments and do continue to contribute. Relatively, how much does it costs for a bunion surgery?